The psychule is a proposed model for the fundamental unit of the mind/sentience/consciousness. The term “psychule” is meant to be analogous to the term “molecule” as the fundamental unit of a substance, except that a psychule is not a substance but a process. Specifically, a psychule is a task/process/event as described by the Framework with a particular set of constraints on the Input and/or Mechanism and/or Output. What are those constraints? The answer is: it depends. The constraints on a task/process/event that make it a psychule depend on the Philosopher asking the question. Some will require particular constraints, others will require additional constraints, and yet others may require alternate constraints. Below is a hierarchy of levels of constraints. At the bottom level there are no constraints. At each higher level new constraints are added. I should point out that the choice of levels is not determinative, i.e., there could possibly be intermediary levels. I am simply choosing levels that seem to correspond to known theories of consciousness or are otherwise useful. Proponents of a given theory would, or should, designate a specific level as the psychule. At the appropriate level I will give my proposal for the psychule. Level 3. [Psychule] This level actually specifies (at least) a pair of coordinated tasks as part of the mechanism. The first task is a functional (level 2) task whose Output is a symbolic sign vehicle. (“Symbolic sign vehicle” is a term from Peirce’s Theory of Signs.) The “purpose” of this output is to be the input for a subsequent task, the Output of which is a valuable response to the object/referent of the symbolic sign. Associated theory: Integrated Information Theory. Level 6. Same as level 4 or higher with the added constraints that the Output can become Input to the same Mechanism. HOT theories. As indicated, I would designate level 3 as the psychule, mostly because I think at this level you can begin to explain qualia. I propose that a quale is best explained as a reference to the meaning of a symbolic sign as described in Level 3 above. I will expand on this in a subsequent post. I should point out here that I do not (necessarily) ascribe “Consciousness” to the mechanism of a psychule. Instead, I ascribe Consciousness to a system which necessarily includes a mechanism capable of a psychule. The “consciousness of a system” is simply a reference to the psychules of which that system is capable. The system in question will include at least a mechanism, but may also include the environment of the mechanism, i.e., the substrates for the Inputs and Outputs. The framework presented here was inspired by, and aspires to be consistent with, David Deutsch’s Constructor Theory Deutsch’s Theory was created by and for physicists, including the requisite esoteric mathematics. Nevertheless, I have found it useful as a grounding basis for much of philosophy, including ontology, epistemology, teleology, causation, and Consciousness. The basic premise of Constructor Theory is that all physical theories can be described in terms of which transformations of matter (processes or tasks) are possible, which are impossible, and why. For the purpose of the current framework, a “task” consists of an input configuration of matter (which can be described by a finite set of physical variables), an output configuration of matter (ditto), and a Constructor (which I will sometimes replace with the words Mechanism or Context) which performs the task by generating the output when presented with the input. While it’s possible to contemplate one-off processes which physically alter the system we call the Context or Mechanism, for our purposes here we (like Constructor Theorists) will be concerned entirely with tasks wherein the Constructor/Mechanism/Context remains essentially unchanged and able to repeat the task. where x1, x2, etc. are the input variables and y1, y2, etc. are the output variables. If Constructor Theory is true, then anything that happens, and anything that has happened, can be described in terms of tasks, because Constructor Theory purports to describe any physical transformation as possible or not, and clearly all physical transformations that have happened were possible ones. One important implication which follows from this framework is that the outputs of transformations can become the inputs of other transformations. Mechanisms can be combined such that any regular network of tasks can be considered a new, higher level task with a new higher-level (super) Mechanism. Thus, individual atoms can be considered Mechanisms, and certain combinations of such Mechanisms can be considered a super Mechanism. Note: the sub-Mechanisms are still Mechanisms in their own right. Another important implication which follows from this framework will be what we mean by causation. For the time being we can put aside the baggage that philosophers have added to the idea of causation. For now, we can say that a Mechanism causes Output when presented with Input. Also, any system of matter can be considered the Output of one or more tasks. Thus, any system of matter, including any Input, will have a Causal History which includes all of the tasks that led up to that system and going all the way (at least) to the Big Bang. The second concept of function refers to working or operating in a proper or particular way. Thus, we say the function of the eyeball is to relay visual information to the brain. In the current Theory, “function” will [usually] mean function in the mathematical sense, and when we want to discuss an entity operating in a proper way, we will say the function is associated with a purpose. C. Things change. To be more specific, things change over time. It turns out there is a recently proposed theory by David Deutsch that expressly addresses this axiom: Constructor Theory. Constructor Theory says that all physical theories can be expressed in terms of which physical transformations (changes) can be made to happen, which cannot, and why. Thus, all of physics is about how things change. In point of fact, everything is about how things change. where the x’s and y’s are physically measurable values. What does this framework do for us? Read on and stay tuned. 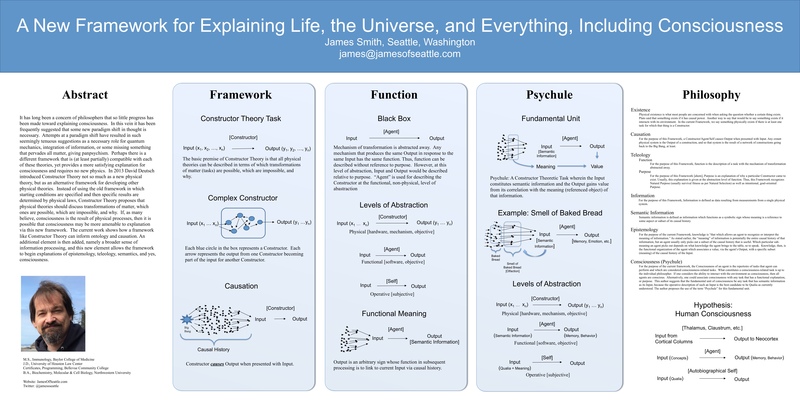 Here is the poster I presented at the 2018 Science of Consciousness conference in Tucson. I was a bit disappointed at the paucity of feedback. I don’t think most people there were interested in a mechanistic explanation of consciousness. Ah well. Please comment if you have any interest. Click on the page links above to see the Theory. Leave comments in the appropriate blog entry below.